Peter Parker is a huge dork, so it's probably not surprising that when he's not busy being your friendly neighbourhood Spider-Man, he's as swept up in Blizzard's hero shooter. But let's ask the real question: Who does Spider-Man play as the most in Overwatch? This week's Spider-Man/Deadpool #10, by Joe Kelley, Ed McGuinness, and Jason Kieth, opens with the heroes recuperating in Deadpool's clubhouse after a close encounter with a strange new villain trying to turn Wade and Peter into a pile of mush. 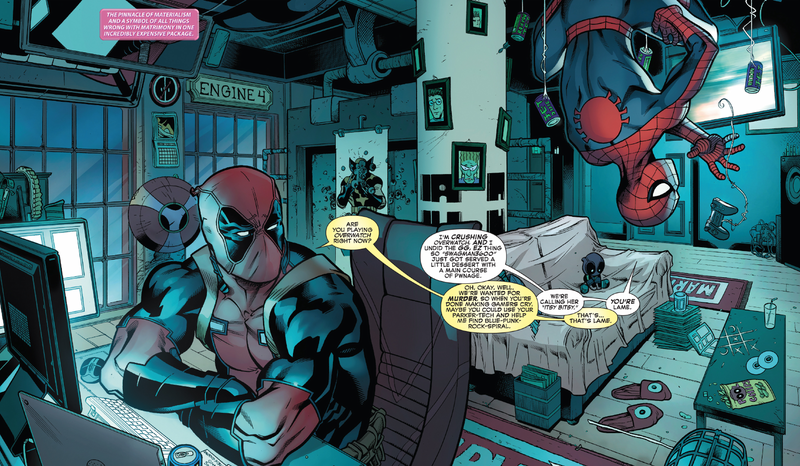 But instead of Deadpool goofing off mid-brainstorm, it's Peter Parker ... by thoroughly thumping some fools in a round or two of Overwatch, apparently. Deadpool probably just wants to save himself for whenever Half-Life 3 comes out. But while we learn the spectacular Spider-Man is a big fan of Blizzard's latest game, we don't get to see who he's playing as. Do you think Spidey's a mean Genji? Maybe he prefers a supportive character like Mercy, or a tank like Reinhardt? I'm gonna guess Tracer, considering Pete's love of a good quip himself. Let's get to the bottom of this clearly crucial moment in comics canon, people. Suggest your theories in the comments below. I see him switching characters with Reinhardt cause he is the protective type, Genji cause his reflex skills would make him insane, Black Widow so he can reuse all his spider puns in chat... not sure who he would play as support.